British-born Tom Price describes himself as, "working in collaboration with materials, processes and phenomena" to produce works which explore the untapped potential of familiar materials by encouraging them to behave in unfamiliar ways. Combining mischievous play with solid design, Tom Price’s practice delves into the grey area between design and contemporary fine art. Price is perhaps best known for his Meltdown series (2007-2018) - unique sculptural furniture manipulated from commonplace industrial materials with masterful dexterity. The process used has required the development of specialist machinery and tools which are capable of subverting industrial manufacturing techniques by introducing a measure of entropy into what is generally an incredibly controlled process. The resulting metamorphosis is spectacular – reality-defying melted sheens form neat seat-shaped imprints into bundles of loosely knit polypropylene blue rope, cable ties, PVC tubing and discarded clothing. 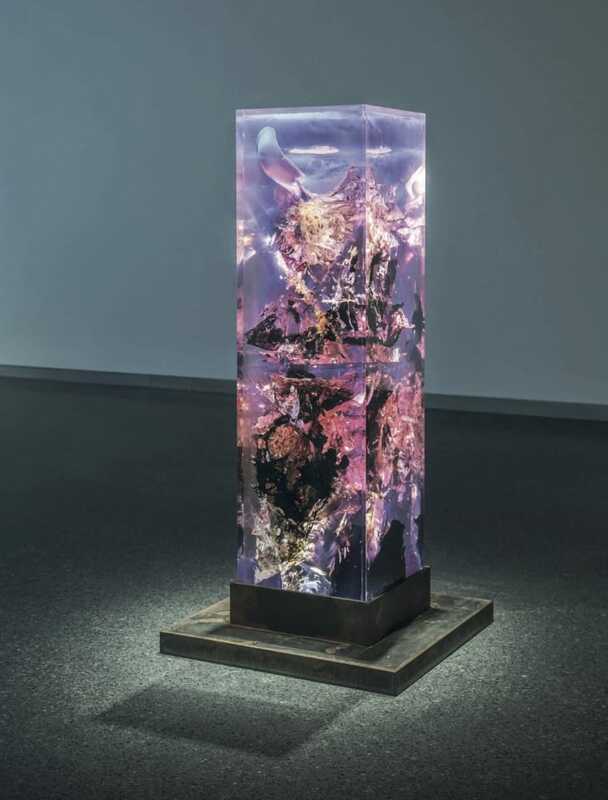 Price's most recent series Synthesis (2014-2018) is a study of a dialogue between resin and tar – and their negotiation for both space and identity when forced to become a singular entity. Within columnar blocks petal-like inclusions are in fact cracks and fissures created through careful manipulation during the catalysing process of the resin. The inclusions cluster around and interact with amorphous invasive bodies of tar, which loom - apparently suspended in space. The tar initially appears densely black, almost light-absorbent, but upon closer inspection, a network of fine green vapour trails can be seen drifting from a surface partially melted by the exothermic reaction of the curing resin. Born in London in 1973, Price continues to live and work in the capital. Since graduating from London’s Royal College of Art, Price has established an international career as an artist and designer with works in major collections and institutions worldwide, including acquisitions by art museums in America: San Francisco MOMA, Denver Art Museum, The Nelson-Atkins Museum of Art and The Mint Museum; as well as the MKG Hamburg, and AmorePacific Museum of Art in Seoul. He has also completed several large-scale sculptural commissions for public and private spaces. Works from Price's series Synthesis were featured in our 2018 summer group show Looking For U, an exhibition exploring themes of identity and communication in the modern age.